It was the night of the beauties once again. The Big Dome was filled with crowds and crowds of people, VIPs, celebrities, judges, and 30 beautiful candidates vying for the title Bb. Pilipinas 2012. Xian Lim, Izza Calzado, Georgina Wilson and Venus Raj hosted the event. The panel of judges include beauty holder Precious Lara-Quigaman, Hon. Casimiro Henares III, HE George Gomeca, HE Harry Thomas Jr., actor Richard Gomez, Lisa Hontiveros, Phili Younghusband of Philippine AZKALS, John Miller of Nestle Philippines and more. The talents who performed were Bamboo and Arnel Pineda. 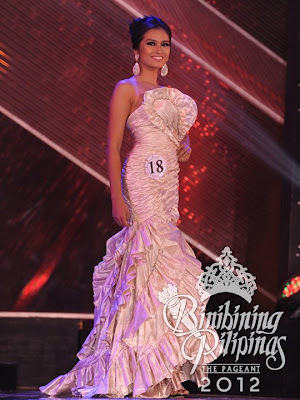 Candidate #18 Janine Mari Tugonon in her evening gown. She is 22 years old and hails from Balanga, Bataan. Bb. Pilipinas-Universe 2011 3rd Runner Up Shamcey Supsup shares her happiness for the pageant winner. Miss Janine Mari Tugonon's crowning moment still with Miss Shamcey Supsup. Candidate #13 Katrina Jayne Dimaranan in her evening gown. Bb. Pilipinas-Tourism Katrina Jayne Dimaranan's crowning moment. She also won Best in Talent. My bet, candidate #8 Nicole Schmitz, kinda reminds me of Bb. Pilipinas International 2009 Melody Gersbach. Nicole also won Best in National Costume and Nestlé Fitnesse Best in Swimsuit. She was not able to win Bb. Pilipinas-Universe but happy that she at least took the title Bb. Pilipinas-International. My other bet to win the crown at the last night's event was candidate #9 Mary Jane Lastimosa. Too bad she did answer well though she made it to the 12 Semi Finalist. She even took home a couple of special awards, Bb. Philippine Airlines and Bb. AVON. How about you? Did your bet win a crown last night? Who is she? We were watching the tv broadcast but could not finish it because it was too late already. But I noted there was no Venus or Shamcey stand-out this year. Sad to say, the fact that last year's first runner-up won the biggest prize this year does not really bode too well for this batch. I was actually rooting for Nicole Schmitz but then again, hey, Janine was still very lovely that evening. I was hoping to catch the airing of the coronation but I missed it big time. Congratulations to the new set of winners this year. Good luck for the coming bigger event.